James found the Daily Double on the 2nd clue. 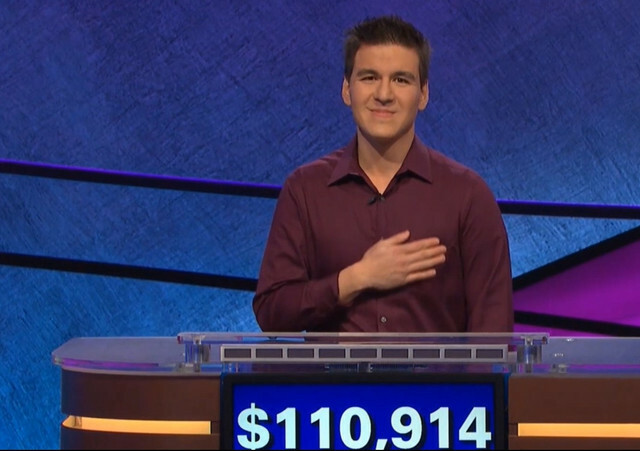 James had $1,000, Ariana was scoreless, and Sameer had nothing in the bank. James made it a True Daily Double, wagering $1,000. Sameer: Jeopardy! champions. That's right. David Madden was one of the writers of my letters of recommendation because I'm involved with the National History Bowl, which he runs. And the other was from my college counselor, Chris Flietas. Don't know if you remember him, but he won two games himself and got over $80,000 from those two games. Alex: Ariana Mikulski is from State College, Pennsylvania. I love it when Jeopardy! has an influence on family life. In your case, it affects your child. Tell me about it. Ariana: Yes. My youngest daughter, Sabina, goes to preschool, and she watches the shows with us. And they were at school, and the teacher asked what season it was, and she raised her hand and answered, "What is winter?" Alex: Great. I love it. 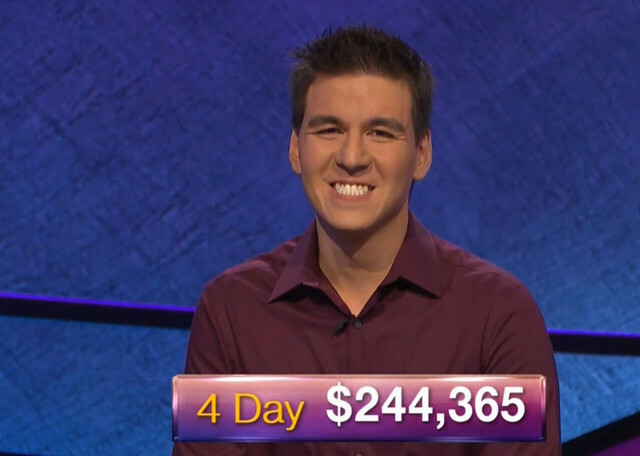 Alex: James Holzhauer from Las Vegas, Nevada. He has wagered big amounts and strange amounts. Is there some significance to your wagering? James: These are all significant dates to me. I wagered $3,268. On March 26, 2008, my first nephew was born. I wagered $9,812. On September 8, 2012, I got married. 11/9/14 is when my daughter was born. And 7/30 is my dad's birthday. And now I think all my relatives are gonna be wanting their own shout-outs now, so. Last edited by Archivists on Tue Apr 09, 2019 10:04 pm, edited 1 time in total. James snagged the next Daily Double on the 3rd clue. James had $14,600, Ariana had $800, and Sameer was at $3,400. James made it a True Daily Double, wagering $14,600. It was James who snatched up the last Daily Double of the game on the 27th clue. James had $46,800, Ariana had $5,600, and Sameer was at $7,000. James wagered $25,000. James: Wager between $0 (venusian) and $58,599 (martian), and enjoy your victory. Sameer: Wager $5,801 to cover Ariana. Ariana: Risk between $601 and $5,200, covering Sameer's $0 bet. PALE AIL $800: Fairer folk rejoice! REI offers UPF clothing, UPF short for this "protection factor"
A SHORT STORY CATEGORY $1600: Competes the title of Susan Glaspell's 1917 tale with a feminist angle, "A Jury of..."
INTERNATIONAL ARCHITECTURE & DESIGN $1200: Former Yankee catcher Jorge could tell you this Spanish word means "inn"
MUSIC FESTIVALS $400: For a 2018 festival Paul McCartney & Metallica were in the "City Limits" of this Texas "Live Music Capital of the World"
Last edited by Archivists on Tue Apr 09, 2019 10:05 pm, edited 1 time in total. Last edited by theFJguy on Tue Apr 09, 2019 11:06 am, edited 1 time in total. hbomb: That'll do it. Absolute greatness. I cannot argue with today's results as that is what the April hyped hinted was possible. James in the opening did the money hand gesture of "make it rain." Alex provided the other bit of foreshadowing with opening remarks including, "If he hits those Daily Doubles, watch out." Sameer's chat time name-dropped David Madden & Chris Fleitas. It would have been funny if one of the names had been Roger Craig on the day his $77,000 one-day record fell. That was a lot of clue calling before DD3 was found at clue 27. James was trying to find it while his opponents were more interested in $400 picks and completing AMERICAN HISTORY where DD2 was located. Roger Craig, Alex Jacob and Brad Rutter watching perhaps could have given James a better search pattern. No argument where DD2 was found early. For DD3 my ranking would have been ASIAN CITIES, A SHORT STORY CATEGORY & INTERNATIONAL ARCHITECTURE & DESIGN. CAT IDIOMS & MUSIC FESTIVALS were the two in my mind that would not have a DD. $25,000 was a monster wager. The scoreboard was 46800 to 7000 to 5600. 71800 afterwards and then 72600 for the FJ! round left James needing a solve on the FJ! clue to break the record. As it turned out, shatter the record since James could bet big. If James had sat at something slightly over $77,000 then he may have needed to bet very low to preserve one of J! hallowed records. The FJ! clue was 3/3 on the show and I'll send it to 75% as I had nothing better than atomic split after trying to work in the word "micro" somehow. As soon as Ariana's correct response was shown I knew that was right. Last edited by MarkBarrett on Tue Apr 09, 2019 11:38 am, edited 2 times in total. The true humbled are we who get to witness this wizardry. Frank Spangenberg is the only player to break $200,000 in his first five games. we all uttered the same ascending whistle upon seeing that, right? Last edited by RobW on Tue Apr 09, 2019 12:39 pm, edited 1 time in total. Back when I was younger, when I still had tiger blood in my veins, I thought I could be the one to break this threshold. Very doubtful these days. But I’m glad I’ve lived to see it. That looks like a score finished with on J! for my PS3 in 2016 (R.I.P. THQ) (made the game a runaway and when it was FJ! time, I wagered everything on the correct response, probably in an act of revenge for what happened 21 years earlier on my Genesis, my 9-year-old self at the time watching in horror as the words "WE DO NOT HAVE A JEOPARDY! CHAMPION THIS TIME!" appeared on a blue background at the bottom of the screen)! Way to go, James! I have a feeling we may have our first superchamp of 2019, while we're at it. Avid J! watcher since 1989 & failing at J! video games since 1995. "King James" seems a fairly accurate description at this point. ...and then stared at them for a few minutes before my brain rebooted. I remember during the all star games when Team Ken was discussing the possibility of going for a 2 day total of 6 figures just because they could safely do so. I remember thinking at the time that might be kind of fun and a little bummed that we now would probably never get a chance to see that. How wrong was I. Way to go James. It's amazing that despite his total, James left nearly 30k on the table. There was 1600 left on the board when he hit DD3, so even if Sameer gets them and doubles up on FJ, he can only get to 17200. James, therefore, could have bet up to 29599, getting him to 77199 before FJ. That would have enabled him to bet up to 63198 in FJ, ending up with $140,397 - without any risk of losing the game. So perhaps we haven't seen his best one day score just yet. Sameer at 7000 on DD3. Getting the remaining clues worth $1600 = $8600 or $17,200 total. As amazing as the 4x total is James has to know he needs a 5th win to be playing in S36. A win tomorrow and then anything is possible including breaking his own 1-day record. If he does it, my wish would be to do it at a pretty number like the previous 34, 50, 75 and & 77K benchmarks. Yes. First to score anything over 77k. Before him, only on two occasions had anyone ever scored above 70k. So it is, how to put it... a quantum leap.